Join us for one of our wine tasting evenings in Birmingham. We've teamed up with Browns in St Martin's Square, near the very central Bullring and Birmingham New Street Station. Choose from our Introductory or Discovery evenings, both are suitable for beginner level or those with a little knowledge already - find more details at Evening Wine Tasting Experiences, with a range of weekday dates including Friday evenings. The wine tastings are educational yet fun and very sociable, so that you can learn about wine in the company of like-minded wine drinkers. As well as the wines to taste, there are sharing platters of light bites to enjoy. We can also host our wine tasting events for private groups or corporate wine tastings at various venues in Birmingham. If you are buying this as a gift experiences for wine-loving friends or family, you can purchase an open dated gift voucher so that a date can be book after your gift has been received. The voucher will be emailed automatically as soon as you have completed your purchase or we have printed gift vouchers that we can post to you for £2 (select at checkout). If you wish to book a specific date simply choose from the forthcoming available dates below. 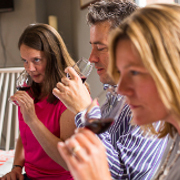 Our Birmingham wine tasting evenings are both refreshing and fun, but also easy for budding wine enthusiasts to get a solid grounding that will help navigate the world of wine with confidence. In addition to tasting some delicious wines there are platters of antipasti to tuck in to for a light supper. Not found what you are looking for? Register your interest in attending a wine tasting event in Birmingham by completing the form below. Once we have a sufficient number of people interested in attending, we will contact you with potential dates and venue details.